To Cite: Hashem Dabaghian F, Hassani A, Nayeri N, Shojaii A, Entezari M. Anti-Proliferative and Apoptotic Effects of Aqueous Extract of Ziziphus Jujube in Human Thyroid Carcinoma Cell Lines (C643), Int J Cancer Manag. 2018 ; 11(7):e65820. doi: 10.5812/ijcm.65820. Background: Ziziphus jujuba, which is known as “Annab” or “Onnab” in Iran, is an effective compound against some cancer cell lines. The present study aimed to investigate the anti-mutagenic and anticancer effects of the aqueous extract of Z. jujuba on C643 human thyroid carcinoma cells. Methods: C643 cells were cultured in (Roswell Park memorial institute) RPMI 1640 medium (Sigma) supplemented with 10% fetal bovine serum (FBS), penicillin-streptomycin, and L-glutamine. After incubating the cultures at 37ºC with 5% CO2, MTT assay was used to determine the inhibitory effect of Z. jujuba on cell proliferation. Cell cycle progression was monitored by sub-G1 apoptosis assay using flow cytometry. Finally, anti-mutagenicity properties of the extract were evaluated using a standard reverse mutation assay (Ames test), which was performed with a histidine auxotroph strain of Salmonella typhimurium (TA100) and exposure to a carcinogenic substance (sodium azide). Results: The aqueous extract of Z. jujuba inhibited the growth of C643 cells in a concentration range of 0.5 - 2 mg/mL and exhibited cytotoxic effects on C643 cells in a concentration-dependent manner (IC50: 1.671 mg/mL). The mechanism of action was the induction of apoptosis in the cells. 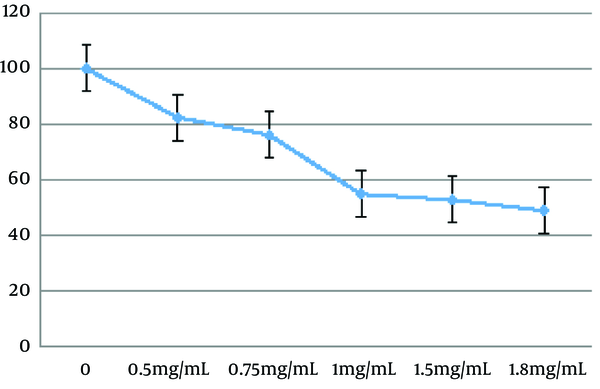 The results of Ames test indicated a significant difference in the anti-mutagenic effects of Z. jujuba aqueous extract and controls (distilled water and sodium azide) (1.671 mg/mL) (P < 0.01). In addition, the herbal extract prevented reverted mutations and the hindrance percent was 87.97%. Conclusions: According to the results, the aqueous extract of Z. jujuba fruit exerted anti-proliferative and apoptotic effects on C643 thyroid carcinoma cell lines and may be potentially useful as an anticancer agent. Cancer is among the three major causes of death in Iran. According to the reports of the Iranian ministry of health, more than 35,000 cancer deaths occur each year (1). Increased incidence of cancer is a consequence of population aging and high prevalence of obesity, smoking habits, environmental carcinogens, and sedentary lifestyle (2). Studies on natural compounds, especially medicinal plants, have confirmed their anticancer effects; therefore, these products could be used independently or in the form of complementary therapy as a cost-effective approach to cancer prevention and treatment (3). Common jujube (Ziziphus jujuba) belongs to the Rhamnaceae family and grows in some regions in Asia, including Iran, India, and China. Jujube is a tree similar to olive tree, with red/brown sweet fruits that contain a single hard seed (4). The Persian name of this fruit is “Annab” or “Onnab”. According to the references of the Persian medicine, jujube can produce new blood cells and refine the blood from harmful humor (blood purifier). Furthermore, jujube is recommended for subsiding coughs and the treatment of some liver, stomach, and bladder disorders (5). Z. jujuba contains vitamin C, phenolic acids, flavonoids, triterpenic acids, and polysaccharides. Moreover, several studies have confirmed the anticancer, anti-inflammatory, antioxidant, hepatoprotective, and gastrointestinal protective properties of this plant (6). The effectiveness of Z. jujuba has also been demonstrated against some cancer cell lines. For instance, Z. jujuba extracts could be used independently or in combination with other plants to induce apoptosis and exert cytotoxic effects on breast cancer (7-9), human hepatoma (HepG2) (10), human cervical carcinoma, human larynx carcinoma, T-cell leukemia (11), and melanoma cell lines (12). To date, no studies have evaluated the anti-mutagenic, anti-proliferative, and cytotoxic effects of Z. jujuba extracts on thyroid carcinoma cells. Considering the rising trend of thyroid cancer (3, 13, 14), the present study aimed to investigate the anti-mutagenic and anticancer effects of Z. jujuba in C643 as human thyroid carcinoma-derived cells. Z. jujuba fruits were purchased from a local herbal market in Tehran, Iran, and the authenticity was approved by Dr. G. Amin (Herbarium of Tehran University of Medical Sciences, Tehran, Iran) (Voucher No: PMP 697). The fruits were dried, ground, and extracted by boiling in distilled water for 30 minutes. The mixture was filtered and dried using a freeze dryer (8, 9), and the obtained dry powder was used for further assessment. The total phenolic content (TPC) of the aqueous extract of Z. jujuba was determined based on the Folin-Ciocalteu method with minor modifications (15). To prepare the calibration curve, one milliliter of the aliquot of 75, 100, 150, and 200 µg/mL hydro-ethanolic (50:50) gallic acid (GAE) solutions was mixed with five milliliters of Folin-Ciocalteu reagent (diluted 10-fold) and four mL (75 mg/mL) of sodium carbonate. The absorption was read at 765 nm after 30 minutes, and the calibration curve was drawn. Afterwards, one milliliter of the herbal extract (1 mg/mL) was mixed with the same reagents as described above, and the absorption was measured to verify the TPC. All the measurements were repeated three times, and the TPC of the Z. jujuba extract was expressed as mean and standard deviation of the µg of the (GAE) equivalents per milligram of the extract (y = 0.0088x - 0.106). The thyroid carcinoma cell line (C643) was purchased from Pasteur Institute of Iran. The cells were cultivated in T75 tissue culture flasks in RPMI-1640 medium, which was supplemented with 10% fetal bovine serum and incubated in a humidified incubator containing 5% CO2 at the temperature of 37°C. After the growth and reproduction of the cells, adherent cells were separated from the flask bottom using trypsin (0.25%), and 5,000 cells were transferred to the flasks. All the examinations were conducted after 18 hours of incubation in the flasks of the cell culture plates. To determine cell viability, dimethylthiazol diphenyl tetrazolium bromide (MTT) assay and the microculture tetrazolium technique have been suggested, which were conducted quantitatively in the present study. The numerical statics could be obtained from the formazan crystals that are originated from metabolically active cells. The mitochondrial dehydrogenase of live cells caused color reduction in the mentioned cells, which contained purple crystals. After 18 hours, various concentrations of the aqueous extract of Z. jujuba were added to the cells, and the plates were incubated with 5% CO2 at the temperature of 37°C for 48 hours. To reduce the test error level, the absorbance level was read after adding the MTT strain to some of the plate wells without the cells (followed by the other wells) and ultimately subtracted from the total absorbance. After 48 hours, Probit analysis was applied in the Pharm/PCS-Pharmacologic Calculation System Modulus (Springer-Verlag, USA) to determine the inhibitory concentration 50% (IC50) of the Z. jujuba extract in the C643 cells. In this stage, we used the method proposed by Karimi et al. (17) for the analysis of the cells in terms of sub-G1 apoptosis. Moreover, the flow cytometric analysis of propidium iodide (PI)-labeled cells was performed to determine the cellular DNA content. The cells were grown to an exponential phase, seeded at the density of 106 cells per well into a 24-well plate, and incubated for 24 hours. In the following stage, the cells were treated by the IC50 and incubated for 48 hours. Afterwards, they were harvested, fixed in ice-cold 70% ethanol, stored at the temperature of 4°C, washed with phosphate buffered saline (PBS) (pH: 7.2), treated with 25 µg/mL RNase at the temperature of 37°C for 15 minutes, and stained with 50 µg/mL of PI for 20 minutes after incubation. Finally, the PI fluorescence of individual nuclei was measured using the FACS caliber apparatus (18). An Annexin-V-FLUOS staining kit (Roche) was used for annexin V binding, and approximately 106 cells (determined by a hemocytometer) were analyzed in accordance with the protocol provided by the manufacturer. In brief, the cells were re-suspended in the Annexin-V-FLUOS labeling solution after they were washed once with PBS. Afterwards, the cells were incubated at the temperature of 15 - 25°C for 10 - 15 minutes, and the samples were measured using the Becton-Dickinson flow cytometer (19). T represents the reversed colonies in each Petri dish with the carcinogen and herbal extract, and M is the reversed colonies in the Petri dishes of positive control (i.e., mutagen). Data analysis was performed in SPSS version 17. Results were expressed as the mean and standard deviation of the indicated number of the independent experiments. In addition, analysis of variance (ANOVA) and Tukey’s post-hoc test were used to compare the mean values, and P-value of less than 0.05 was considered statistically significant. Mean TPC of the Z. jujuba aqueous extract was estimated at 0.85 ± 0.1 µg of GAE/mg of the extract. To investigate the potential effects of the Z. jujuba aqueous extract, the cells were exposed to the extract at the concentrations of 0, 0.5, 0.75, 1, 1.5, 1.8, and 100 mg/mL for 48 hours (8, 9). According to Figure 1, the herbal extract induced cell apoptosis in a dose-dependent manner (P < 0.01). Mean IC50 of the C643 cell line was calculated to be 1.671 ± 0.14 mg/mL after 48 hours. In the present study, the effects of the Z. jujuba aqueous extract on the cell cycle progression were assessed using flow cytometry with 1.671 mg/mL of the extract to determine its inhibitory mechanism. As is depicted in Figure 2, treatment of the cells by the herbal extract was associated with a significant increase in the sub-G1 apoptotic content. Sub-G1 was formed in 0.64% of the cells (Figure 2A), while the concentration of 1.67 mg/mL resulted in the sub-G1 phase in 50.46% of the cells (Figure 2B) in the absence of the herbal extract. Figure 2. Effects of Z. jujuba aqueous extract on cell cycle progression at 48 hours: A, control; B, treatment (1.67 µg/mL). Several hallmark features of apoptosis were developed in the cancer cells upon treatment with the Z. jujuba extract, including phosphatidylserine exposure. The cancer cells exposed phosphatidylserine on their plasma membrane within 48 hours of exposure to the herbal extract (1.671 mg/mL). Level of annexin V binding to the phosphatidylserine molecules exposed on the cell surface was determined as well (Figure 3). Approximately 67.9% of the cells exposed phosphatidylserine after 48 hours of extract treatment when the proportion of the annexin V-bound cells was quantitated (P < 0.01). Figure 3. Apoptotic effects of Z. jujuba aqueous extract on cancer cells at 48 hours: A, control; B, treatment (1.67 mg/mL). The results of colony counting in the Ames test using 1.671 mg/mL of the Z. jujuba aqueous extract showed a significant difference in the anti-mutagenic effect on colony growth compared to sodium azide and distilled water (P < 0.01). In addition, the Z. jujuba aqueous extract prevented reverted mutations with the hindrance percent of 87.97% in the anti-mutagenicity test. Current treatments for malignancies are associated with a wide range of adverse complications. In recent years, an increased tendency has been reported toward discovering natural compounds, particularly plant-based alternatives, as preventive or therapeutic agents in cancer treatment (21-23). Some reports have confirmed the efficacy of some fruits and vegetables in reducing the risk of chronic diseases, including cancer (24-26). Since mutagenesis, tumor initiation, and progression are closely correlated with the production of free radicals and subsequent oxidative stress and inflammation (27), plants with antioxidant and anti-inflammatory properties (e.g., Z. jujuba) are among the viable options as anticancer agents considering their ability to scavenge reactive radical species and decrease DNA damage (28-30). Flavonoids, ascorbic acid, anthocyanin, and phenolic acids are the main antioxidant compounds in Z. jujuba (6, 31). Flavonoids are able to prevent or treat cancers by triggering apoptosis (32-34). In addition, Z. jujuba contains terpenoids (6), which are a class of cancer chemopreventive and anti-tumor agents (35, 36). According to the literature, 11 triterpenoic acids have been derived from Zizyphus jujuba fruits (37). The primary results of the current research demonstrated that the Z. jujuba extract inhibited the growth of C643 cells within a concentration range of 0.5 - 2 mg/mL. Further analysis indicated that the extract could cause morphological changes, representing apoptosis in cultured C643 cells. Moreover, Z. jujuba had cytotoxic effects on C643 cells in a concentration-dependent manner (IC50: 1.671 mg/mL). The sub-G1 apoptosis assay confirmed that Z. jujuba induced apoptosis in C643 cells, while the results of the MTT and sub-G1 assays clearly indicated the cytotoxic effects of Z. jujuba on C643 cells. According to the results of the present study, the prevention percentage of the aqueous extract of Z. jujuba was 87.97%. According to the Ames theory, when the prevention percentage is less than 25%, 25 - 40%, and more than 40%, the anti-mutagenic effects of interventional chemicals are considered to be negative, moderate, and strong, respectively (38, 39). Previous studies have indicated the significant anti-proliferative effects of the Z. jujuba fruit on various cancer cells. For instance, Huang et al. reported the anticancer activities and apoptosis induction of the Z. jujuba fruit in human hepatoma cells (10). Findings of a study investigating the effects of Z. jujuba on HeLa, Hep-2, and leukemia cells showed similar results (11). In addition, previous studies have confirmed the anti-proliferative and apoptotic effects of bioactive constituents of the Z. jujuba fruit extract (especially triterpenes) on breast cancer cell lines (MCF-7 and SKBr3) (7). In a research in this regard, Hoshyar et al. reported the cytotoxic effects of Z. jujuba on breast cancer cells. The hematological and biochemical changes associated with Z. jujuba treatment result in the antioxidant and anti-inflammatory effects of this plant. Z. jujuba has been shown to exert preventive effects against anemia, lymphocytosis, and neutrophilia caused by N-nitrosomethylurea as mammary gland carcinogens in rats. In addition, low levels of serum lactate dehydrogenase, alkaline phosphatase, total protein, and albumin in the Z. jujuba group indicated that this plant could control the cellular destruction caused by tumor progression (8). In another study, Abedini et al. reported the effects of Z. jujuba on OV2008 (cervical cancer cells) and MCF-7 (breast cancer cells). Moreover, apoptosis induction with the enhanced expression of the Bax gene and decreased Bcl2 gene was observed (9). Bax and Bcl2 are the genes that regulate apoptosis, and the balance between their expression and distribution is the main determinant of cell death (40). Similarly, Hung et al. reported the anti-proliferative effects of the deproteinized polysaccharide derived from the Z. jujuba fruit on melanoma cells. In addition, the authors claimed that apoptosis induction is one of the mechanisms of action associated with increased caspase-3 and caspase-9 activities (12). Apoptosis induction was also observed in the present study, which is in congruence with the previous findings in this regard (7, 10, 11). Apoptosis is a vital component of normal cell turnover in body tissues, which normally occurs during development and aging, and its inhibition is considered to be an important factor in many cancers (32-34, 41, 42). In the current research, we attempted to assess the anti-mutagenic effects of Z. jujuba extract using the Ames test. The Ames test is one of the most recent tests to assay anti-mutagenesis using bacteria with special mutants. The Ames test applied the mutant strains of Salmonella typhimurium (TA100) that cannot grow in the absence of histidine amino acid since a mutation has occurred in a gene encoding one of the nine enzymes used in the pathway of histidine synthesis, preventing the translation of a functional enzyme; consequently, the conversion of the catabolic intermediate into histidine cannot be completed. Therefore, the Ames mutants are auxotrophic and known as histidine-dependent or his- (pronounced his-minus) mutants since they can only grow if histidine is supplied in the growth medium (19, 20). Despite the common application of the Ames test, other tests should also be developed to be used beforehand in order to confirm the anticancer effects of various compounds. In the present study, the sub.G1 assay confirmed that Z. jujuba could induce apoptosis in C643 cells (Figures 2 and 3). In this regard, Abedini et al. reported the effects of Z. jujuba on the gene expression involved in the cell cycle regulation. Furthermore, they stated that Z. jujuba increased p53, p27, and p21 mRNA levels, while decreasing the CD1 mRNA level and changing the expression of Bax and Bcl2 (apoptosis-regulating genes) and their ratio (9). For the first time, we showed that the aqueous extract of Ziziphus jujuba fruit has anti-proliferative and apoptotic effects on C643 thyroid carcinoma cell lines. Our findings indicated that Z. jujuba is a valuable fruit with potential benefits in cancer prevention and treatment. It is recommended that further investigation be conducted to assess the anticancer properties of Z. jujuba in animal and human models. Hereby, we extend our gratitude to the research institute for Islamic and complementary medicine for the financial support of the study. This research project was performed in Islamic Azad University (Zanjan Branch) in Zanjan, Iran. Authors’ Contribution: Study concept and design: Fataneh Hashem Dabaghian, Maliheh Entezari, acquisition of data: Azita Hassani, Navid Nayeri, analysis and interpretation of data: Maliheh Entezari, Asie Shojaii, drafting of the manuscript: Fataneh Hashem Dabaghian, Maliheh Entezari, critical revision of the manuscript for important intellectual contents: Maliheh Entezari, statistical analysis: Fataneh Hashem Dabaghian, Maliheh Entezari, administrative, technical, and material support: Maliheh Entezari, study supervision: Maliheh Entezari. 1. Sadjadi A, Nouraie M, Mohagheghi MA, Mousavi-Jarrahi A, Malekezadeh R, Parkin DM. Cancer occurrence in Iran in 2002, an international perspective. Asian Pac J Cancer Prev. 2005;6(3):359-63. [PubMed: 16236000]. 2. Torre LA, Bray F, Siegel RL, Ferlay J, Lortet-Tieulent J, Jemal A. Global cancer statistics, 2012. CA Cancer J Clin. 2015;65(2):87-108. doi: 10.3322/caac.21262. [PubMed: 25651787]. 3. Hodgson NC, Button J, Solorzano CC. Thyroid cancer: is the incidence still increasing? Ann Surg Oncol. 2004;11(12):1093-7. doi: 10.1245/ASO.2004.03.066. [PubMed: 15576834]. 4. Bown D; Herb Society of America. Encyclopedia of Herbs and Their Uses. Dorling Kindersley; 1995. 5. Aghili-Khorasani MH. Annab Makhzan al-adviah. Tehran: Research Institute for Islamic and Complementary medicine; 2008. 6. Gao QH, Wu CS, Wang M. The jujube (Ziziphus jujuba Mill.) fruit: a review of current knowledge of fruit composition and health benefits. J Agric Food Chem. 2013;61(14):3351-63. doi: 10.1021/jf4007032. [PubMed: 23480594]. 7. Plastina P, Bonofiglio D, Vizza D, Fazio A, Rovito D, Giordano C, et al. Identification of bioactive constituents of Ziziphus jujube fruit extracts exerting antiproliferative and apoptotic effects in human breast cancer cells. J Ethnopharmacol. 2012;140(2):325-32. doi: 10.1016/j.jep.2012.01.022. [PubMed: 22301448]. 8. Hoshyar R, Mohaghegh Z, Torabi N, Abolghasemi A. Antitumor activity of aqueous extract of Ziziphus jujube fruit in breast cancer: An in vitro and in vivo study. Asian Pac J Reprod. 2015;4(2):116-22. doi: 10.1016/s2305-0500(15)30007-5. 9. Abedini MR, Erfanian N, Nazem H, Jamali S, Hoshyar R. Anti-proliferative and apoptotic effects of Ziziphus Jujube on cervical and breast cancer cells. Avicenna J Phytomed. 2016;6(2):142-8. [PubMed: 27222827]. [PubMed Central: PMC4877962]. 10. Huang X, Kojima-Yuasa A, Norikura T, Kennedy DO, Hasuma T, Matsui-Yuasa I. Mechanism of the anti-cancer activity of Zizyphus jujuba in HepG2 cells. Am J Chin Med. 2007;35(3):517-32. doi: 10.1142/S0192415X0700503X. [PubMed: 17597510]. 11. Vahedi F, Fathi Najafi M, Bozari K. Evaluation of inhibitory effect and apoptosis induction of Zyzyphus Jujube on tumor cell lines, an in vitro preliminary study. Cytotechnology. 2008;56(2):105-11. doi: 10.1007/s10616-008-9131-6. [PubMed: 19002848]. [PubMed Central: PMC2259261]. 12. Hung CF, Hsu BY, Chang SC, Chen BH. Antiproliferation of melanoma cells by polysaccharide isolated from Zizyphus jujuba. Nutrition. 2012;28(1):98-105. doi: 10.1016/j.nut.2011.05.009. [PubMed: 21820868]. 13. Haselkorn T, Bernstein L, Preston-Martin S, Cozen W, Mack WJ. Descriptive epidemiology of thyroid cancer in Los Angeles County, 1972-1995. Cancer Causes Control. 2000;11(2):163-70. [PubMed: 10710201]. 14. Li N, Du XL, Reitzel LR, Xu L, Sturgis EM. Impact of enhanced detection on the increase in thyroid cancer incidence in the United States: review of incidence trends by socioeconomic status within the surveillance, epidemiology, and end results registry, 1980-2008. Thyroid. 2013;23(1):103-10. doi: 10.1089/thy.2012.0392. [PubMed: 23043274]. [PubMed Central: PMC3539256]. 15. Miliauskas G, Venskutonis PR, van Beek TA. Screening of radical scavenging activity of some medicinal and aromatic plant extracts. Food Chem. 2004;85(2):231-7. doi: 10.1016/j.foodchem.2003.05.007. 16. Entezari M, Atabi F. Preparation and Characterization of Myristoylated Chitosan Nanogel as Carrier of Silibinin for Breast Cancer Therapy. Gallen Med J. 2017;6(2):136-44. 17. Karimi R, Parivar K, Hayati Roudbari N, Vakili Sadeghi S, Hashemi M, Hayat P. Anti-proliferative and Apoptotic Effects of morin in human Leukemia cell lines (HUT-78). Int J Cell Molecul Biotechnol. 2013;2013:1-13. doi: 10.5899/2013/ijcmb-00001. 18. Traub ML, De Butte-Smith M, Zukin RS, Etgen AM. Oestradiol and insulin-like growth factor-1 reduce cell loss after global ischaemia in middle-aged female rats. J Neuroendocrinol. 2009;21(12):1038-44. doi: 10.1111/j.1365-2826.2009.01927.x. [PubMed: 19840235]. [PubMed Central: PMC2862345]. 19. Hashemi M, Nouri Long M, Entezari M, Nafisi S, Nowroozii H. Anti-mutagenic and pro-apoptotic effects of apigenin on human chronic lymphocytic leukemia cells. Acta Med Iran. 2010;48(5):283-8. [PubMed: 21287458]. 20. Entezari M, Majd A, Falahian F, Mehrabian S, Hashemi M, Lajimi AA. Antimutagenicity and anticancer effects of Citrus medica fruit juice. Acta Medica Iranica. 2009;47(5):373-7. 21. Newman DJ, Cragg GM, Snader KM. Natural products as sources of new drugs over the period 1981-2002. J Nat Prod. 2003;66(7):1022-37. doi: 10.1021/np030096l. [PubMed: 12880330]. 22. Paterson I, Anderson EA. Chemistry. The renaissance of natural products as drug candidates. Science. 2005;310(5747):451-3. doi: 10.1126/science.1116364. [PubMed: 16239465]. 23. Bathaie SZ, Mousavi SZ. New applications and mechanisms of action of saffron and its important ingredients. Crit Rev Food Sci Nutr. 2010;50(8):761-86. doi: 10.1080/10408390902773003. [PubMed: 20830635]. 24. George VC, Dellaire G, Rupasinghe HPV. Plant flavonoids in cancer chemoprevention: role in genome stability. J Nutr Biochem. 2017;45:1-14. doi: 10.1016/j.jnutbio.2016.11.007. [PubMed: 27951449]. 25. Ravishankar D, Rajora AK, Greco F, Osborn HM. Flavonoids as prospective compounds for anti-cancer therapy. Int J Biochem Cell Biol. 2013;45(12):2821-31. doi: 10.1016/j.biocel.2013.10.004. [PubMed: 24128857]. 26. Wang W, Wang J, Li N, Zhang X, Zhao W, Li J, et al. Chemopreventive flavonoids from Millettia pulchra Kurz var-laxior (Dunn) Z.Wei (Yulangsan) function as Michael reaction acceptors. Bioorg Med Chem Lett. 2015;25(5):1078-81. doi: 10.1016/j.bmcl.2015.01.009. [PubMed: 25630222]. 27. Biswas SK. Does the Interdependence between Oxidative Stress and Inflammation Explain the Antioxidant Paradox? Oxid Med Cell Longev. 2016;2016:5698931. doi: 10.1155/2016/5698931. [PubMed: 26881031]. [PubMed Central: PMC4736408]. 28. Clarkson PM, Thompson HS. Antioxidants: what role do they play in physical activity and health? Am J Clin Nutr. 2000;72(2 Suppl):637S-46S. doi: 10.1093/ajcn/72.2.637S. [PubMed: 10919970]. 29. Chen SC, Chung KT. Mutagenicity and antimutagenicity studies of tannic acid and its related compounds. Food Chem Toxicol. 2000;38(1):1-5. [PubMed: 10685008]. 30. Suzuki YJ, Forman HJ, Sevanian A. Oxidants as Stimulators of Signal Transduction. Free Radic Biol Med. 1997;22(1-2):269-85. doi: 10.1016/s0891-5849(96)00275-4. 31. Cheng G, Bai Y, Zhao Y, Tao J, Liu Y, Tu G, et al. Flavonoids from Ziziphus jujuba Mill var. spinosa. Tetrahedron. 2000;56(45):8915-20. doi: 10.1016/s0040-4020(00)00842-5. 32. Watson WH, Cai J, Jones DP. Diet and apoptosis. Annu Rev Nutr. 2000;20:485-505. doi: 10.1146/annurev.nutr.20.1.485. [PubMed: 10940343]. 33. Yang CS, Landau JM, Huang MT, Newmark HL. Inhibition of carcinogenesis by dietary polyphenolic compounds. Annu Rev Nutr. 2001;21:381-406. doi: 10.1146/annurev.nutr.21.1.381. [PubMed: 11375442]. 34. Manson MM. Cancer prevention -- the potential for diet to modulate molecular signalling. Trends Mol Med. 2003;9(1):11-8. [PubMed: 12524205]. 35. Shishodia S, Sethi G, Konopleva M, Andreeff M, Aggarwal BB. A synthetic triterpenoid, CDDO-Me, inhibits IkappaBalpha kinase and enhances apoptosis induced by TNF and chemotherapeutic agents through down-regulation of expression of nuclear factor kappaB-regulated gene products in human leukemic cells. Clin Cancer Res. 2006;12(6):1828-38. doi: 10.1158/1078-0432.CCR-05-2044. [PubMed: 16551868]. 36. Zhang H, Jiang L, Ye S, Ye Y, Ren F. Systematic evaluation of antioxidant capacities of the ethanolic extract of different tissues of jujube (Ziziphus jujuba Mill.) from China. Food Chem Toxicol. 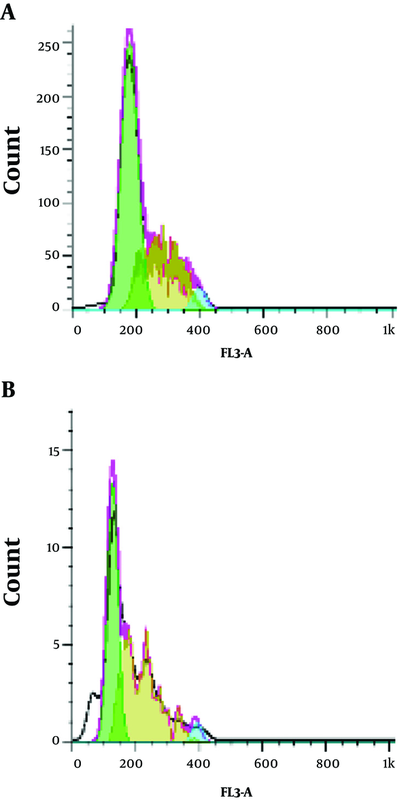 2010;48(6):1461-5. doi: 10.1016/j.fct.2010.03.011. [PubMed: 20230870]. 37. Lee SM, Min BS, Lee CG, Kim KS, Kho YH. Cytotoxic triterpenoids from the fruits of Zizyphus jujuba. Planta Med. 2003;69(11):1051-4. doi: 10.1055/s-2003-45155. [PubMed: 14735446]. 38. Entezari M, Dabaghian FH, Hashemi M. The comparison of antimutagenicity and anticancer activities of Echinophora platyloba DC on acute promyelocytic leukemia cancer cells. J Cancer Res Ther. 2014;10(4):1004-7. doi: 10.4103/0973-1482.137907. [PubMed: 25579544]. 39. Dabaghian FH. Antimutagenicity and Anticancer Effects of Biebersteinia multifida DC. Annu Res Revi in Biol. 2014;4(6):906-13. doi: 10.9734/arrb/2014/7193. 40. Piltan A, Totonchi M, Rezazadeh M, Gourabi H, Karimian L, Baghaban Eslaminejad MR, et al. Quantitative expression of BAG1, BAX and BCL-2 genes in human embryos with different fragmentation grades derived from ART. Yakhteh Med J. 2010;12:257-66. 41. Elmore S. Apoptosis: a review of programmed cell death. Toxicol Pathol. 2007;35(4):495-516. doi: 10.1080/01926230701320337. [PubMed: 17562483]. [PubMed Central: PMC2117903]. 42. MacFarlane M, Williams AC. Apoptosis and disease: a life or death decision. EMBO Rep. 2004;5(7):674-8. doi: 10.1038/sj.embor.7400191. [PubMed: 15218528]. [PubMed Central: PMC1299101].